According to the WBO rules, if Munguia moves up - as the 154 champion he would become the mandatory to the WBO's middleweight champion, who at the moment is Demetrius Andrade. "The truth is that he is very ambitious and I like that about Munguía. He wants to fight with the best in the world. And when you are the best in the world like Canelo, and if you are a champion like Munguía, a fight like that has to be fought in the future," said De la Hoya to ESPN Deportes. "If they are at the same weight, at 160 pounds, and if Munguía is crowned champion in that division, then there is no reason on why that fight can not take place. We'll see what happens, because Canelo is at the level where he wants to fight with world champions." Fishnets Delahoya will cash out his hype job Munguia. 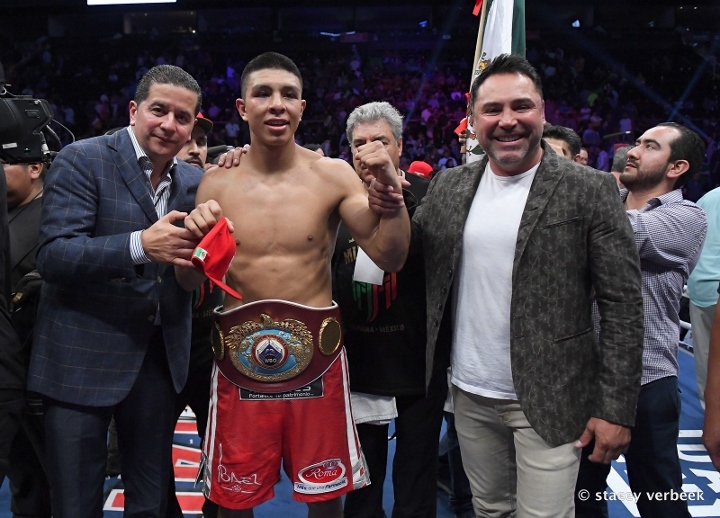 Munguia will Never be a threat to Canelo.